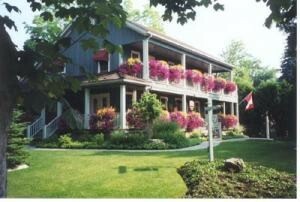 Our five cozy guest rooms are smoke-free, fully air-conditioned, contain Queen or King/Twin beds and all have private ensuite baths. Each is tastefully decorated reflecting their individual names, 'Forest Room', 'Vintage Room', 'Periwinkle Room', 'Garden Room' and 'Harvest Room'. All our rooms are equipped with coffeemakers, kettles, and bar fridges with complimentary pop and water. In all our rooms we have phones for your use to make local calls and FREE long distance within continental North America. The rooms also have cable TV's and DVD/CD players. 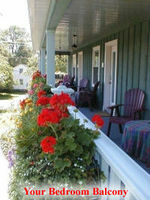 Our inn has high speed wireless internet and we have hard wire internet in our Garden and Harvest Rooms. Full hot breakfast is included. We also have a complete set of bicycles on the the premises for your own use. All suites have private exterior entrances giving our guests complete freedom to come and go as they please without worrying about disturbing the household. Stay out as late as you wish or rise early with the sun....either way, you'll truly feel you have both the comforts of an 'Inn' yet the privacy of home. Your reservation with 'WeatherPine' comes with our promise that when you arrive, you will not be disappointed. We guarantee that what we have represented in our advertising is factual, that 100% cleanliness in our rooms, around our property and within our home is our standard and that we have met or exceeded all your expectations. Should you arrive and feel disappointed in any way, your reservation deposit will be immediately refunded and we will make an 'on-the-spot' effort to find you the accommodations you're looking for. That's how confident we feel about our home, our hospitality and our ability to make your stay totally comfortable and wonderfully memorable. Right across the road from Pillar and Post where there is a top of the line restaurant and Spa, and within walking distance to all the Shaw theatres. Excellent spot for small meetings or incentive rewards. Weatherpine - your best alternative to hotels ! From the Queen Elizabeth Way (QEW), take the Niagara Stone Road cutoff. Turn left at York Road to Airport Road (first street on right). Turn right. At second stop sign turn right onto Niagara Stone Road. When you get to Old Towne Niagara-on-the-Lake look for John Street. Turn right and follow 4 blocks to Regent Street. We are on the corner. If in doubt, follow the signs for the Pillar and Post as we are directly across the street. A full breakfast is included. We start with juice, yogurt and fruit and then a hot main course along with coffee (regular or decaf) and tea (a selection including decaf is available). We do our best to cater to those with food allergies. Description: This romantic, main floor room is the largest of our rooms and can sleep 3 if required and has it's own entrance from the outside. Seclusion is complete with your own private deck in the backyard. Bathroom Description: Three piece bathroom that includes a steam unit in the shower that is sure to relax. Description: Main floor room with its own private entrance for the outside. Description: Here you will have to step up to your four poster bed complete with quilted bedspread. Step directly from your room onto the covered balcony with your own table and chairs. Bathroom Description: Three piece with tub/shower combination. Description: This room is decorated in a wine related motif and has it's own entrance from the outside to the covered balcony with your own table and chairs. Bed can be made into Twins if required. Bathroom Description: Three piece bathroom with a double walk-in shower. Description: This bright, second floor room is decorated in rich greens. It has it's own entrance to the outside to the covered balcony with your own table and chairs.